Why does Royce think small-caps are well suited to active management? 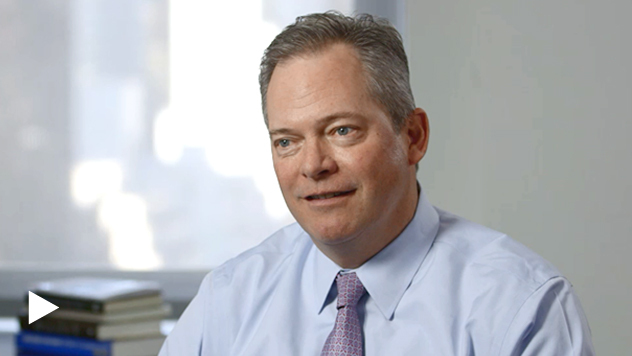 We believe very strongly in active management and small-caps. We think it's an enormous and diverse universe of companies. The companies in the sector tend to be more self-determinate of their success or failure than their larger counterparts that tend to be more, sort of macro-sensitive in terms of the drivers of their business. Active management is, is incredibly well-suited to that, because of the labor intensity, because of the diversity of outcomes, lower correlations, higher volatility. Some see indexes as representing an asset class. What is Royce’s view? Simplistically, ‘asset class’ is a very relevant idea in the context of building a portfolio of asset... assets that have certain correlative characteristics over time that drive good outcomes. But we actually think a little bit differently about our segment of the market. Rather than thinking about small caps as an asset class, we really think about it as a very diverse opportunity set in which there is a permanent opportunity for security selection, for companies to succeed within the context of their industries, within the context of their own operating capabilities, irrespective of some of the macro drivers that tend to be more important in this idea of, you know, larger cap. Why might passive strategies start to struggle? Passive strategies have been deeply rewarded by this idea that a rising tide will lift all ships, and the Financial Crisis created a very unique set of circumstances where central banks worked very hard to construct an environment that supported all businesses. That obviously makes actively differentiating between businesses increasingly complicated. I believe that's all begun to change. We believe this intervention, this idea that we need to support asset prices, or need artifical supports for asset prices and businesses is essentially over, whereby risk management and performance of companies will be self-determinate. As interest rates are rising, as risk management is once again being rewarded in the marketplace, we believe those stronger companies, better managed companies, better capitalized companies will be able to increase their competitive positioning and drive much better returns. In a lower return environment, where investors are trying to accomplish a set of objectives, any excess return is increasingly valuable, and we believe strongly that there is a permanent opportunity for excess return in the small-cap environment. Why does Royce look well-positioned for this potentially upcoming environment? Because of the tenure of our portfolio managers and our domain knowledge. Those may sound like simplistic ideas, but they are deeply important in our segment of the market, whereby companies largely live their lives in our zone, you know, we believe experience, pattern recognition, the analytical database that we have built over time, and the overall experience and tenure of our managers is deeply important prospectively because we are heading into a much more normal sort of environment for correlation, volatility, and equity returns. And in that environment, we believe sort of our competitive positioning, our exclusive focus over 40-plus years on this asset class, will really differentiate us going forward. Frank Russell Company (“Russell”) is the source and owner of the trademarks, service marks and copyrights related to the Russell Indexes. Russell® is a trademark of Frank Russell Company. Neither Russell nor its licensors accept any liability for any errors or omissions in the Russell Indexes and / or Russell ratings or underlying data and no party may rely on any Russell Indexes and / or Russell ratings and / or underlying data contained in this communication. No further distribution of Russell Data is permitted without Russell’s express written consent. Russell does not promote, sponsor or endorse the content of this communication. The Russell 2000 Index is an unmanaged, capitalization-weighted index of domestic small-cap stocks. It measures the performance of the 2,000 smallest publicly traded U.S. companies in the Russell 3000 Index. 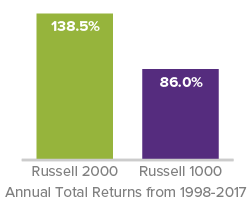 The Russell 1000 index is an unmanaged, capitalization-weighted index of domestic large-cap stocks. It measures the performance of the 1,000 largest publicly traded U.S. companies in the Russell 3000 index. The performance of an index does not represent exactly any particular investment, as you cannot invest directly in an index.